If you've read some of my previous posts, you may have noticed we call our eldest son "Jelo". No, that's not his real name...he real name is Juilan Angelo. So his nickname is the "J' from Julian and the "-elo" from Angelo. I know, its cute! Jelo had once heard the news weather refer to the city of Julian. He was instantly curious about the city of Julian. We've promised from for a long time we'd take him for a vist, last weekend we finally did! Auntie Joyce and Uncle Mikey joined us for our trip into the mountains some some apple picking and apple pie! We started our visit with some apple picking at Raven Hill Ochard, For $10 you get a bag with you fill with as many apples as you can! There were rows and rows of apple trees that our boys loved to run up and down. 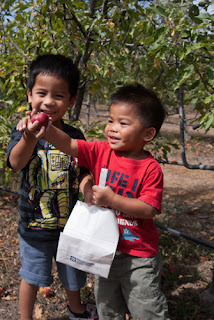 They enjoyed finding the "really red" apples and had daddy help pick the best ones that were way high up in the trees. Being a mom is my greatest joy in life! Although being a mommy can get hectic and stressful with my two boys under the age of 5, the good times definitely outweigh the bad! My 2 year old DJ and I have never been to a theme park with just the two of us even though we've had year passes to the San Diego Zoo, Sea World, and Disneyland during his lifetime. Our visits to these places usually involve our two boys, my husband, and I with the occasional aunt, uncle, cousin, and/or grandparent accompanying us. 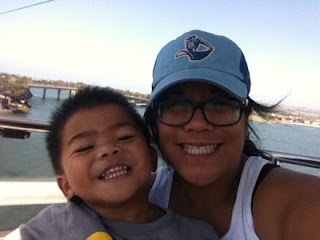 As the end of our Sea World annual pass approached, I decided to take DJ to Sea World, just him and I. The day at Sea World with DJ allowed me to focus on just him. He had my attention 100% and vice versa. It was nice to spend the day not having to divide myself between my two boys who want me to listen to everything they have to say and to watch everything they do. I love party planning and I love my family! So when I can put the two together, TOTAL HAPPINESS! This past weekend, I helped decorate for my cousin, Amanda's, 18th birthday party. Typically, Filipino young ladies do not have a "sweet 16" but an 18th birthday "debut". Some families go all out and have a "debutante ball" in honor of their daughter with a banquet hall, sit down dinner, formal attire, and the works. Others, like myself, still had a "debut" but a more intimate party with close friends and family. My cousin Amanda and her parents chose the latter as well. The party was a backyard pool party with a black, white, and orange theme. Black and white because of Amanda's love of Pandas and the orange because of her favorite color. 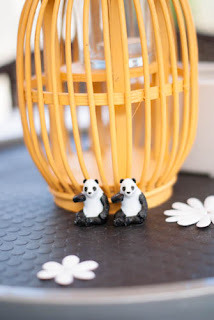 I bought black/white and orange hanging lanterns and table lanterns from Wholesale Flowers. I love that place! They have an array of flowers, vases, and other decorative accents to make any party fabulous! Today was the usual Friday afternoon freeway commute: boys in the backseat, KidsBop on the radio, and ideas bumping around into head of where to have dinner. 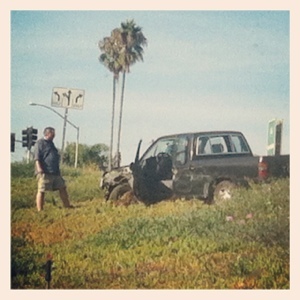 Until all of a sudden our car was hit from behind: bang, bang, bang! A series of bangs as our car was rammed from behind, then a long push as the car behind us accelerates while pushing our car making it uncontrollable. The car behind finally pulls off to the side, accelerating and ending up in the ice plant off the shoulder a few meters ahead of us as we also pull over. In celebration of my hubby's birthday, I planned a surprise party for him! I sent him off to a two hour Thai massage and when he came home, SURPRISE! Our closest friends and family gathered to wish him happy birthday! He walked in the house kinda slow. If you've ever had a Thai massage, you know of the after-pain :/ He was surprised nonetheless and was happy to see all if the special people in our lives there to celebrate his birthday! 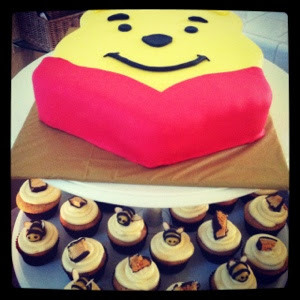 The party theme was honey and Winnie the Pooh. My hubby loves Pooh! Tennessee honey whiskey iced tea, honey Swiss fondue, honey fruit parfaits, red cabbage honey lime slaw, and honey glazed BBQ were all a part of the menu. A few non-honey, but hubby favorites, made the menu too: salted pepper chicken wings and egg foo young from our favorite Chinese restaurant, Golden Chopsticks! Being new to the BLOG-isphere, I've been visiting many different blog sites and learning BLOG-tiquette as I go along! 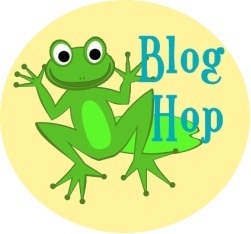 Today, I'm learning how to Blog-Hop! So here we go! In the spirit of the Happiness Project of this hop, I'm reminded of what truly makes me happy. The joy of motherhood is on the top of my happiness list. Although my boys can often times drive me up the wall with their wacky ways, the happy times outweigh the crazy times. Their hugs, their "I love yous", and their laughter take all the worries and stresses of the day go away. Here are a few other bloggers sharing what makes them happy! I can't believe the year has gone by so fast! I have just completed run #9 of 12 for my resolution for 2012! This month Eleina and I did an evening run with www.torchlight5k.com. What made this run different from my other runs is that I was pushing both my sons in their jogger stroller! This was a first! My boys were great cheerleaders the entire time encouraging me to keep going, to go faster, and reminding me that the finish was "almost there"! DJ tried to run to the finish line but he tripped and instead cried while I carried him across the finish line! The run was beautiful with Mission Bay and the sunset all around us! We were all disappointed that there weren't any "torches" along the route as the pictures on the website showed! We had fun nonetheless! Thanks to hubby for taking pictures of us at the finish! Earlier this year, a friend of mine invited me to participate in a "get one, give one" craft activity. If you chose to participate, for every crafty gift you received, you'd have to return the favor! For that activity, I made some scarves that had some cute feather accents attached to the ends. I then received some custom drink coasters that had my pictures of my husband, kids, and I on them! Super cute! The others have yet to return the favor! Hey girls! I'm waiting...waiting...waiting! Its ok, patience is a virture! LaidOffMom is hosting a similar craft share she's calling "A lil' bit of L-O-V-E". So, I'll get something crafty from her, if I share something crafty with all of you! So, the first three to post a comment down below will get a two pairs of DIY earrings! In the words of fashion diva Ru-Paul "you better work, cover girl, work it girl, give us a twirl, do your thing on the runway..." the models at Fashion Week San Diego's press conference did just that! 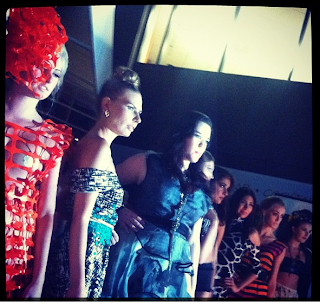 The preview of the designers pieces were eye catching and got me super excited for what's to come! I can't wait to see what A-Doreus has to showcase and hopefully I'll be able to afford some goodies for myself at the trunk show! Roppongi was a great host: wine, hors d'oevres, and an awesome firepit to give natural light to the fashions. Here you can find the Calendar of Events for Fashion Week San Diego. Use the promo code STYLE for a $10 discount on any of the week's events! See you at the runway....you better work...work it girl! For a little history on my 12 runs for 2012 challenge, you can click here and here! For the month of August, I decided to start my Cupcake 26.2 Virtual Marathon! Over 40 friends and family (and friends of friends) joined me for the month of August to complete 26.2 miles! It was great to see those who don't run/walk/bike take this opportunity to get moving! 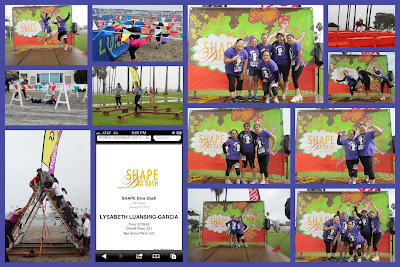 It was even more awesome to see my runner friends encourage everyone to get moving! I loved the pictures of cupcakes people posted at the completion of their miles! It was so successful, I decided to do the create an official Facebook page for the Cupcake 26.2 Virtual Marathon and Twitter @cupcake26_2VM. I hope these social media endeavors continue to encourage anyone and everyone to complete 26.2 miles every month! I love the weekends! Especially long ones! This weekend we decided to surprise the boys in a mini-vacay to Orange County. We started off at our usual Home Depot kids workshop. The boys made a goal post for paper football. It was quick and easy to make! We then headed for the freeway. Jelo kept asking "where are we going" and our answer was always "it's a surprise!!!!" When we got near to our destination, Jelo noticed the "knotts berry farm" sign at the freeway exit and he said, "are we going to knotts?" he figured it out! 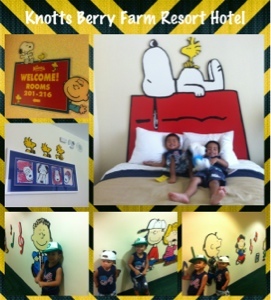 We checked into the the knotts berry farm hotel and resort. Our room was in the snoopy wing with custom snoopy decorated rooms. The boys loved it! Jelo even asked "can we just live here mom? ", haha!